Khandvi is a very famous Gujarati dish made using gram flour or besan. It is a very light and a healthy tea time snack recipe. 1. Take 1.5 cup of water in a bowl. Add curd and blend it. Add gram flour and mix properly. 2. In Kadai, pour the batter and cook on medium flame. Add all spices except mustard seeds and sesame seeds. Cook it till batter is cooked properly. Test it by spreading the batter on flat greased surface. If an even coat is getting removed, batter is cooked. Spread the complete batter on greased plates and allow it to cool properly. 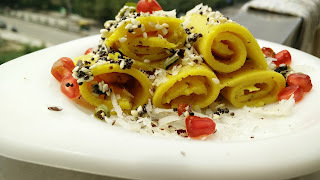 Cut strips of khandvi and make rolls. 3. For tempering, heat little oil and sputter mustard seeds and chopped green chilly. Switch off the flame and add sesame seeds. Spread this tempering on top of Khandvi rolls and garnish with coconut and pomegranate seeds. Khandvi is ready to serve.